Ogni anniversario di Mons. Romero ci dà nuove comprensioni circa la sua persona. Questo anniversario passato non è stato differente. In primo luogo, la visita dal Presidente Obama alla Tomba ha presentato una figura di Romero più universale, e meno ideologica. L'anno scorso---dopo il trentesimo anniversario---abbiamo celebrato il Romero che conosciamo, o il Romero che pensiamo che conosciamo. Infatti, lo avevamo ridotto ad una versione bidimensionale di sè. Questo anno, eravamo più disposti a vederlo con nuovi occhi. Questo anno, il Romero che vediamo è più intero. Vediamo più dell'uomo. Non solo la sua denuncia ed il suo martirio, ma il resto della sua vita, anche. Questo anno, un'esposizione delle fotografie sta mostrandoci una nuova dimensione della vita di Romero. Vediamo un giovane Romero che sembra felice ed equilibrato. Non è un malcontento o un antisociale. Sembra felice fra la gente, fra i bambini. Il più sorprendente, ha una dimensione artistica -- ha preso alcune delle fotografie. Sembra che un'altra parte di Romero sia anche risorto. He came, he saw ... he lit a candle. President Barack Obama, at his own initiative, visited the tomb of Archbishop Romero during his brief stop in El Salvador—the only outing outside of his official cortege, save for a visit to the U.S. Embassy—leaving behind a wake of snarled traffic and many unanswered questions. The one we will concern ourselves with here, is: Does Obama’s visit help or hurt the canonization cause, or even matter at all? 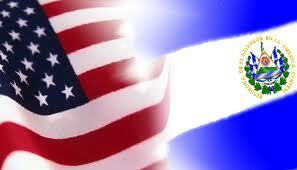 For additional discussion, please see the post mortem in Tim’s El Salvador Blog. The short answer is that Obama’s visit does not hurt, and that it does, in fact help, but only indirectly, Romero’s canonization cause. It does not hurt, despite the fact that the visit was a political act by a political leader, and we have been told for years that the “politicization” of Archbishop Romero has been impeding the progress of the canonization drive. Here, we must note the extreme care and discretion with which the President’s visit was handled. Obama did not (to the chagrin of the activists) go down to Romero’s Tomb to give a speech or otherwise make a big political statement. In fact (to the disappointment of the journalists present), Obama did not make a statement at all. He went to the Crypt, accompanied by the current archbishop, and lit a candle at Romero’s grave. The approach was delicate and respectful: the scene was not even broadcast live (to the frustration of television audiences). And, to the extent that Obama’s visit had political content at all, the message was reconciliation and overcoming the division and conflict of the past. For that reason, Obama’s visit does not hurt at all. While Obama’s visit definitely did not hurt, it also did not help directly. 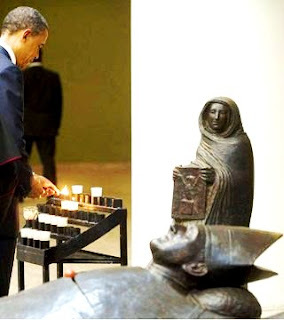 That is, the fact that the President of the United States visits a would-be saint’s grave does not add weight to any of the considerations being deliberated in the Vatican to determine whether or not he is a saint. There is no credit for having friends in high places and, while the President of the United States may be “the most powerful man on earth,” he should not and does not wield authority over a religious process like a canonization cause. But this does not mean that Obama’s visit will not help at all. In fact, it should help in two important respects. First, Obama’s visit is a high profile event: as Archbishop Escobar said, a “world event,” which can shape the world image of Archbishop Óscar Romero. The visit by a President of the United States strengthens and bolsters the idea that Archbishop Romero is being transformed into—or has already become—a universal figure, as opposed to a partisan figure that is attractive only to a narrow ideological sector. Secondly, and perhaps more importantly, Obama’s visit can help assure that the impression becomes the reality, and that Romero is accepted by a broad segment of the society, including the various political factions; and that the Left accedes to this process and stops using him as a proprietary symbol. Obama’s visit provides a template of how this can be accomplished. Obama showed the Left that you can literally go down to Romero’s grave and bow your head and light a candle and that, even though you don’t shout slogans and have a sit-in, that act is symbolic enough that it will send an unmistakable signal of solidarity and empathy with Romero’s cause. On the other hand, it also showed the Right that there is a necessity to acknowledge the past, to pay respects to the victims, and to begin to celebrate the heroes who stood against repression and abuse. If the visit leads to some conversion—or, at least, some conversation—then it will do much needed good. Como Cristo, Mons. Romero enfrentó el momento de su Sacrificio con serenidad: Mons. Romero espió a los asesinos posicionándose a la entrada de la Capilla y al francotirador apuntándole con su rifle. Así lo confirman manchas en sus vestimentos indicativas “de una efusión repentina y profusa” debido a que “en los segundos anteriores a su muerte, Mons. Romero, habiendo visto a su asesino, sudó como una reacción natural al ‘shock’ y la anticipación de lo que estaba a punto de suceder”. (Stonyhurst Curator returns to San Salvador, ROMERONEWS, edición no. 3, enero del 2009.) “Que este cuerpo inmolado y esta Sangre Sacrificada por los hombres nos alimente también para dar nuestro cuerpo y nuestra sangre al sufrimiento y al dolor”, dijo, preparando la Eucaristía, “como Cristo—no para sí, sino para dar cosechas de justicia y de paz a nuestro pueblo”. El amigo de Mons. Romero, Mons. Ricardo Urioste también sostiene que Mons. Romero vio a sus asesinos en los segundos antes del disparo (Comentario de Mons. Urioste en la Celebración Ecuménica del Vigésimo Aniversario del Martirio de Mons. Romero en Catedral Metropolitana, 24 de marzo del 2000), algo que es lógico dado que Divina Providencia es una Capilla pequeña. Sin desmayarse ante a la muerte, Mons. Romero concluyo su oración con serenidad: “Unámonos pues, íntimamente en fe y esperanza a este momento de oración por Doña Sarita—y por nosotros”. En ese momento, estalló el disparo. Por tu Sagrado Corazón yo prometo darme todo por tu gloria y por las almas. Quiero morir así, en medio del trabajo; fatigado del camino, rendido, cansado... me acordaré de tus fatigas y hasta ellas serán precio de redención, desde hoy te las ofrezco. Señor Jesús, por tu Corazón y por las almas: promitto [prometo]. U.S. President Barack H. Obama visits the Tomb of Archbishop Óscar A. Romero in the Crypt of the San Salvador Metropolitan Cathedral on Tuesday, March 22, 2011, two days before the 31st anniversary of Archbishop Romero's assassination. 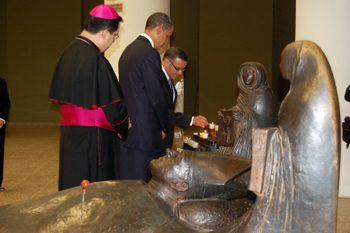 • El Presidente de Estados Unidos Barack H. Obama visita la Tumba de Monseñor Óscar A. Romero en la Cripta de la Catedral Metropolitana de San Salvador el martes 22 de marzo del 2011, dos días antes del 31° aniversario del asesinato de Mons. Romero. • Il Presidente degli Stati Uniti Barack H. Obama visita la tomba dell'arcivescovo Óscar A. Romero nella cripta della cattedrale metropolitana di San Salvador il martedì 22 marzo 2011, due giorni prima del trentunesimo anniversario dell'assassinio di Mons. Romero. Like Jesus, Romero was plagued by enemies who wanted to catch him in a trap: they wanted to ensnare Romero in the charge that he was an agitator and Marxist sympathizer. Also like Jesus in the Gospel account, Romero responded to his accusers with a humane and sophisticated retort which unmasked the false legalisms of their arguments and challenged the accusers to confront their own consciences first. Romero’s argument slowly built up to the memorable “Stop the repression” discourse, but began, like Jesus’ doodles on the ground, with Romero setting up the groundwork for the argument, building it, thinking it through. Romero then laid out in explicit detail the many violations of constitutional rights in El Salvador, which made the meager reforms offered by the Junta appear so useless. Before going into detail, Romero noted that Pope John Paul II had highlighted deaths in Rome in his recent public statements: “I am sure that if the Pope were in my place he would point out not only the ten people who had been cruelly assassinated in Italy, but would take the time, like we are doing here, to point out the numerous assassinations that occur day after day.” Then, Romero began the terrible litany. He “reported that at least 78 murders had been perpetrated by state security forces during the previous week alone.” (Margaret PFEIL, PhD, Gloria Dei, Vivens Pauper: A Theology of Transfiguration, Catholic Peace Fellowship, Vol. 4.2, Spring 2005.) He went over the various incidents that produced those figures, one by one. “A day earlier, he noted, Amnesty International had declared that in El Salvador, human rights were being violated to an extreme not seen in other countries.” (Id.) Noting 600 political assassinations and the displacement of 3,500 peasants fleeing persecution, “Amnesty had established that in El Salvador human rights are violated to a worse degree than the repression in Chile after the coup d'état,” he said. No soldier is obliged to obey an order against the law of God. No one has to fulfill an immoral law. It is time to take back your consciences and to obey your consciences rather than the orders of sin. The Church, defender of the rights of God, of the law of God, of human dignity, of the person, cannot remain silent before such abominations. We want the government to understand seriously that reforms are worth nothing if they are stained with so much blood. Romero’s conclusion had been impactful and poignant. 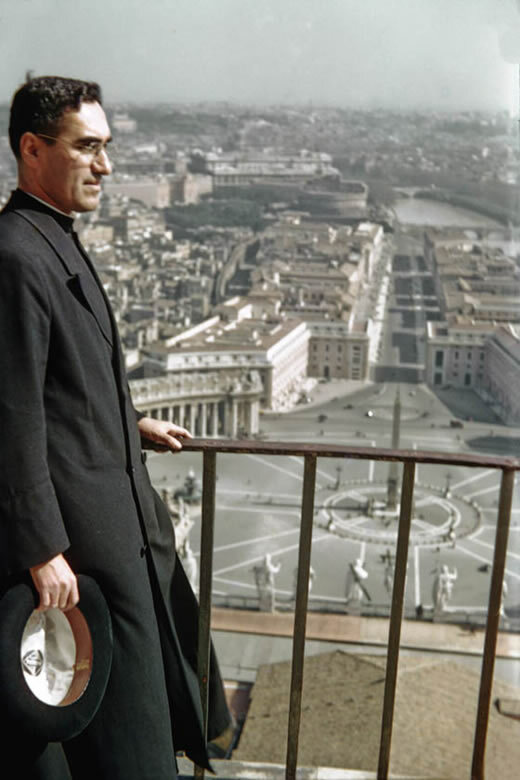 In a famous poem, Bishop Pedro Casaldaliga proclaimed, “Saint Romero of America, our pastor and martyr: No one will silence your final homily!” Father Roy Bourgeois once blasted a recording of the sermon into the School of the Americas military training grounds. “Stop the Repression” has been reproduced in graffiti, posters, songs, t-shirts and websites, making this the most important homily in the history of the Latin American Church. (See, Top Ten Romero Quotes, June 22, 2006, Yahoo San Romero Discussion Group). 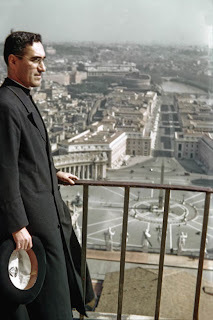 “After the mass Romero stood on the steps of the basilica greeting people, listening to them. Some offered him little children to take in his arms. Others touched him and blessed themselves.” (James BROCKMAN, Romero: A Life (Orbis, New York, 1989), p. 242). At some friends’ house, later, that night, Romero “was silent and took off his glasses, which was unusual. At table he was unusually quiet; he gave ... a silent look as though he wanted to [say] something, and tears came to his eyes. The family wondered what was wrong. Then he began to talk about his best friends, recounting their virtues.” (Id.) It was his last night on this earth. Come abbiamo speculato in questo blog, il Presidente degli Stati Uniti Barack Obama visiterà la tomba di Mons. Romero durante il suo soggiorno nel Salvador il 22-23 marzo 2011, la Casa Bianca ha annunciato oggi. Per più su la visita di Obama, visita prego il Blog di Tim sul El Salvador (in inglese). La situación era grave. “Nos hemos polarizado”, analizaba Mons. Romero: “cada uno de nosotros está polarizado, se ha puesto en un polo de ideas intransigentes, incapaces de reconciliación, odiamos a muerte”. El remedio era igual para cada uno: “Que no llegue a ser tan profundo el modo como tú quieres a tu país distinto del otro que lo quiere de otra manera, que te sientas que tú eres el único dueño de las soluciones y como si fueras el único dueño del país”. En una de las frases más increíbles de su arzobispado, Mons. Romero exclamó aquel domingo—el penúltimo domingo de sus predicaciones—“ Dios lo quiere”. Esta es la misma frase (“Deus Vult”) que el Papa Urbano II había utilizado en el año 1095 para lanzar la Primera Cruzada, solo que el antiguo líder de la cristiandad la usó para hacer guerra, mientras que Mons. Romero la usó para insistir en la Paz, predicando de que “nada violento puede ser duradero, que hay perspectivas aún humanas de soluciones racionales y, sobre todo, por encima de todo, está la palabra de Dios que nos ha gritado hoy: ¡RECONCILIACION!” La palabra era inequívoca para Mons. Romero y declaró: “Soy un Ministro de esa Iglesia de la reconciliación”. Quería actualizar las palabras de “San Pablo hablándole a los corintios, como lo que yo pudiera decir aquí hablando a los santos de San Salvador que son ustedes los bautizados, los que forman el pueblo de Dios. Como Pablo a los Corintios yo les digo a ustedes sus mismas palabras: nos encargó el servicio de reconciliar”. Para, Mons. Romero, la reconciliación, la paz social, era la tierra prometida—la meta actual. “Cada país tiene su tierra prometida en el territorio que la geografía le señala”, fue su punto de partida. Pero sobre este significado textual estaba una “realidad teológica: de que la tierra es un signo de justicia, de la reconciliación”. Monseñor desarrolla la idea a través de diversas fuentes bíblicas, comenzando con la lectura del día sobre la Pascua de Gilgal, celebrada por Josué en la tierra prometida: “no olvidemos que la tierra está muy ligada a las bendiciones y promesas de Dios”, recordó Monseñor. “Adán saliendo del paraíso, hombre sin tierra, es fruto del pecado”. Posteriormente, “‘Toda esta tierra te la daré’, le había dicho Dios a los patriarcas; y después del cautiverio, conducidos por Moisés y Josué, aquí está la tierra”. 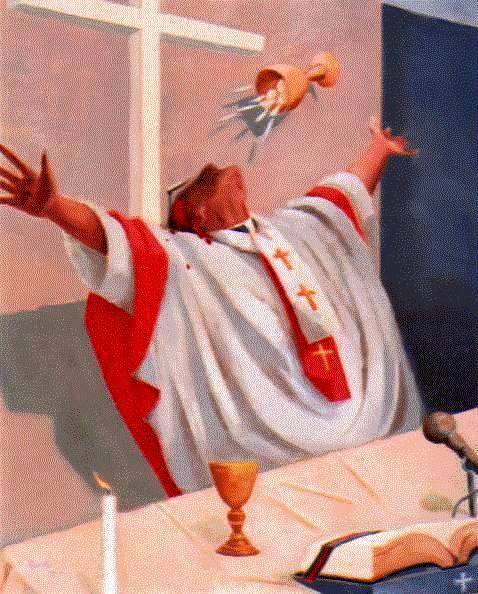 Tejiendo otras ideas, Monseñor cita el Libro de Oseas cuando Israel olvida “que de Dios ha recibido la tierra y los frutos”, y con las «Confesiones» de San Agustín cuando advierte contra la explotación y el hedonismo . Finalmente, refiere “una preciosa Carta Pastoral de todos los obispos del Brasil,” titulada precisamente “La Iglesia y la Tierra”, para matizar el tema central de su homilía: que la aproximación “hacia la tierra prometida, es el símbolo de un peregrinar, de un retornar, de un buscar la reconciliación”. El tema de la tierra era extremadamente oportuno el 16 de marzo de 1980, cuando la dictadura militar pretendía ofrecer una reforma agraria para dar una distribución más equitativa de la tierra y así prevenir el conflicto sanguinario que se avecinaba y que Mons. Romero quería desesperadamente evitar. “Las reformas agrarias son una necesidad teológica”, admite sin reparos Mons. Romero. “No puede estar la tierra de un país en unas pocas manos, tiene que darse a todos; y que todos participen de las bendiciones de Dios en esa tierra”. Citando a los Obispos de Brasil y haciendo suya su pronunciación, Mons. Romero declara: “Apoyamos los esfuerzos del hombre del campo por una auténtica Reforma Agraria, que le posibilite el acceso a la tierra en condiciones favorables para su cultivo”. La Iglesia no se estaba enfrentando con el gobierno sobre esa reforma. Era otro el tema. De nuevo, Mons. Romero nos regresa al Antiguo Testamento, y a otro capítulo relacionado con la tierra. “Una vez más”, acusa Mons. Romero al catalogar una semana de desatada represión, “el Señor pregunta a Caín: ¿Dónde está Abel, tu hermano?” Aparte del fallido atentado dinamitero en su propia basílica, otra iglesia capitalina había sido ametrallada, y las víctimas fatales de la semana ascendían a niveles jamás imaginados. “Y aunque Caín le responde al Señor que no es el guardián de su hermano, el Señor le replica: La sangre de tu hermano me está gritando desde la tierra”. En solo cuatro días habían sido ultimados 43 campesinos, 11 obreros, 22 estudiantes, 2 profesionales, 5 otras personas de los sectores populares y 3 miembros de las fuerzas de seguridad. “Por eso te maldice esta tierra, que ha abierto sus fauces para recibir de tus manos la sangre de tu hermano. Aunque cultives la tierra, no te pagará con su fecundidad”. La tierra prometida se encontraba hipotecada por el pecado. Y esta era la razón porque, a pesar de favorecer la reforma agraria, y su implicada equitativa distribución de la tierra, la Iglesia no podía estar conforme con esta reforma: “No olvidemos esa palabra de Dios a Caín: la tierra ensangrentada nunca podrá ser fecunda. Las reformas ensangrentadas nunca podrán ser fructuosas”. El ejemplo fratricida de Caín y Abel hace contraste dramático con el Evangelio del día, la parábola del Hijo Prodigo, que Mons. Romero caracteriza como “la parábola de la reconciliación cristiana”. Se detiene primero para comentar que constituye una “página bellísima” de las Escrituras. “Yo no sé si hay una página más bella en el Evangelio”, se maravilla. “Todo el Evangelio es bellísimo, pero cuando uno lee lo que hoy hemos escuchado: los dos hijos, el hijo menor que toma su herencia y se va a derrocharla y, sobre todo, el cariño de aquel padre que está esperando; y la reconciliación final de la parábola... uno dice: ¡qué vida más hermosa si de veras, a pesar de nuestros pecados, tuviéramos en cuenta el proyecto de Dios para reconciliarnos con Él”. Solo al hacerlo seríamos, “una patria de hermanos, todos hijos de un Padre que nos está esperando a todos con los brazos abiertos. Así sea”. Su homilía había durado casi dos horas. Ahora le quedaba una semana y un día para vivir. Post Datum: En su «Mensaje Para la Cuaresma 2011», el Papa Benedicto XVI también advierte contra “un vínculo egoísta con la ‘tierra’, que nos empobrece y nos impide estar disponibles y abiertos a Dios y al prójimo”. Acercándonos a los pobres, dice el Papa, nos acercamos a Dios: “haciendo más pobre nuestra mesa aprendemos a superar el egoísmo para vivir en la lógica del don y del amor; soportando la privación de alguna cosa —y no sólo de lo superfluo— aprendemos a apartar la mirada de nuestro 'yo', para descubrir a Alguien a nuestro lado y reconocer a Dios en los rostros de tantos de nuestros hermanos”. «La liberazione che padre Grande predicava è ispirata alla fede, una fede che ci parla di una vita eterna, una fede che ora egli, con il viso rivolto al cielo, accompagnato da due contadini, offre nella sua totalità, nella sua perfezione, la liberazione che culmina nella felicità in Dio; la liberazione che prende avvio dal pentimento del peccato, la liberazione che si appoggia a Cristo, unica forza salvatrice; questa è la liberazione che ha predicato Rutilio Grande». -- Mons. Oscar Romero, Omelia nella messa delle esequie del padre Rutilio Grande (testo in italiano, spagnolo, e inglese) ucciso il 12 marzo 1977. In a widely used “Romero liturgy” published by the Claretians, Óscar Romero’s entire preaching is succinctly—and, accurately—summed up as: “The Church: Called to repentance; called to prophecy.” This title also aptly describes Archbishop Romero’s March 9, 1980 sermon. (This is a series on Romero’s seven final sermons: Read the English text of the Homily here, and the original Spanish text here.) This sermon contained a pure distillation of Romero’s call to repentance and prophecy, with the high drama of Romero’s most powerful sermons. Joined at the altar by the coffins of two assassinated human rights workers, Romero accepted a Peace Prize from Swedish Action for Ecumenism at an overflowing Basilica of the Sacred Heart while his Metropolitan Cathedral continued to be occupied by popular organizations. His sermon was disseminated throughout the country by hand-held cassette tape recorders and CB broadcasts, because the Church’s radio station had been taken out by a bomb intended to silence the archbishop, but international relay stations were broadcasting it live to the rest of the Continent. Romero’s emphasis can be measured by the frequency of particular words in his preaching. (Timothy SHORTELL, Radicalization of Religious Discourse in El Salvador: The Case of Oscar A. Romero, SOCIOLOGY OF RELIGION, Vol. 62, No. 1, March 22, 2001.) In this sermon, Romero uses the words “repent” or “repentance” a resounding twenty-seven (27) times, and he uses the word “penance” another seven (7) times. By contrast, he only says “liberation” four (4) times. Clearly, Romero’s preaching has revved up to a new level of intensity in this Lenten sermon in which he has begun to perceive that “the Calvary and the Cross” are just around the corner. Later that same day, he was scheduled to say the funeral Mass for Mario Zamora, an opposition leader who had been assassinated. After the service, a bundle of dynamite was found near the pulpit from which Romero had spoken. Even though the explosives did not go off, if they had, they were calculated to have been sufficient to take out the entire city block that the Basilica was built on. 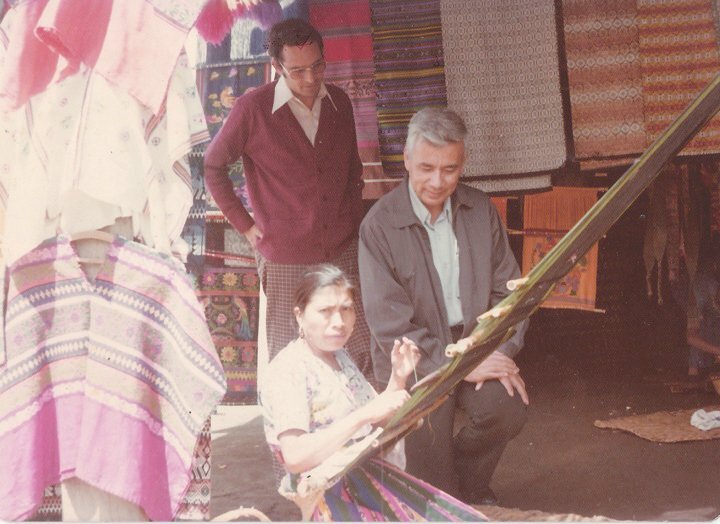 Romero also commented in this sermon on two reforms that had been proposed by the military-civilian junta governing El Salvador to avert war, agrarian reform and bank reform. In tandem with the hair raising litany of hundreds of recent political killings, Romero pleads that the repression has to stop, if any reform is going to be effective. A couple of times, Romero apologizes for having to wade into political issues: “the pastor has to speak of politics not because he is a politician but because from the perspective of God’s dynamism politics is under God’s dominion.” He also reminds the Left that this subordination requires them to maintain a healthy respect for “God’s dominion” of the field, reminding them that God required Moses to remove his sandals before approaching the Burning Bush, and therefore insisting that the Church’s call to repentance must be heeded by all sectors of society, including (and, perhaps, even, especially) by its would-be liberators. Los grupos insurgentes buscaban imponer una revolución proletaria a base de la violencia que tampoco tenía semejanza a la visión divina que Mons. Romero quería dibujar, y les advierte que, “no puede haber verdadera liberación mientras no se libera el hombre del pecado”. Por eso: “Debían de tenerlo en cuenta todos los grupos liberadores que surgen en nuestra Patria: que la primera liberación que tiene que propiciar una agrupación política que de veras quiere la liberación del pueblo, tiene que ser: liberarse él mismo de su propio pecado. Y mientras sea esclavo del pecado, del egoísmo, de la violencia, de la crueldad, del odio, no es apto para la liberación del pueblo”. La Iglesia “seguirá reclamando a todos los liberadores de la historia que ... pongan su confianza en el gran liberador Jesucristo ... Y mucho cuidado con robarle al pueblo estos sentimientos cristianos que lo hacen tan noble y tan vigoroso”. Durante los tres años de su arzobispado, había utilizado la Fiesta de la Transfiguración para “recordar con su pueblo el lugar de la historia salvadoreña dentro del tiempo de Dios, la historia de la salvación”. (Margaret PFEIL, PhD, Gloria Dei, Vivens Pauper: A Theology of Transfiguration [La gloria de Dios es que viva el pobre: Una Teología de la Transfiguración], Catholic Peace Fellowship, Vol. 4.2, primavera del 2005.) “Publicó sus cuatro cartas pastorales en esa fecha, cuidadosamente situando las señales de los tiempos, tanto eclesiales como sociales, en contraste con el trasfondo del horizonte de esperanza escatológica”, analiza una estudiosa de la teología católica. “Predicando sobre los relatos sinópticos de la Transfiguración cada seis de agosto y cada segundo domingo de Cuaresma, Romero paulatinamente desarrolló una teología de la Transfiguración”. PFEIL, Ibid. En marzo de 1980, Romero presentó una síntesis de toda esa espiritualidad. “La Teología de la transfiguración está diciendo que el camino de la redención pasa por la cruz y por el calvario, pero que más allá de la historia está la meta de los cristianos”, anunció Mons. Romero. Jesús Transfigurado era la figura redentora y transformadora que Mons. Romero quería ofrecer como la mejor estampa sobre aquel trasfondo de convulsión. “Cristo colocado en la cumbre del Tabor es la imagen bellísima de la liberación”, declaró Monseñor. El Jesús que resplandece sobre la montaña es “una antorcha de la eternidad”, dice, resaltando la referencia visual. Como tal, la imagen de la Transfiguración es un faro que nos llama a aspirar por otro mundo, “más allá de la historia”, más allá de la realidad material—el Plan de Dios. “Plan amoroso, poderoso, para transfigurar a los pueblos salvándolos de todas sus miserias, injusticias y pecados, para transformarlos en pueblos de la belleza y desde la justicia y santidad del mismo Cristo”. En el relato de la Transfiguración, Jesús, acompañado por sus discípulos, Pedro, Santiago y Juan, sube al monte de Tabor, y brilla intensamente cuando aparecen a su lado los profetas Moisés y Elías; luego, la voz de Dios proclama, «Este es mi Hijo de mis complacencias: escuchadle a Él» (Lucas 9, 35). Esta era la imagen con la cual Mons. Romero podía hacer un gran contraste a la oscura realidad de su país. “Así quiere Dios a los hombres”, afirmó en su homilía, “arrancados del pecado, y de la muerte, y del infierno, viviendo su vida eterna, inmortal, gloriosa”. En esta condición, los hombres son elevados por Dios, “hasta la dignidad de hacerlos sus hijos”. Por esa exaltación del hombre a manos de Dios, a la Iglesia “le duele encontrar cadáveres de hombres, torturas a hombres, sufrimiento de hombres ... Todo hombre es hijo de Dios y cada hombre matado es un Cristo sacrificado que la Iglesia también venera”, declaró con su característica claridad. Post Datum -- Durante su oración del «Angelus» del 6 de marzo de 2011, el Papa Benedicto XVI dijo que Jesús “nos hace sentir la alegría de ser hijos del Padre que está en los cielos”, pero el hombre “prefiere las arenas de las ideologías, del poder, del éxito y del dinero”, y aunque todo esto “puede satisfacer por un momento el orgullo ... al final, nos deja vacíos e insatisfechos”.